Ayatollah Milani attends the Christian Muslim Forum held on the 15th December 2016 at Al-Khoei Foundation celebrating the occasion of Mawlid of al-Nabi and festival of Christmas. 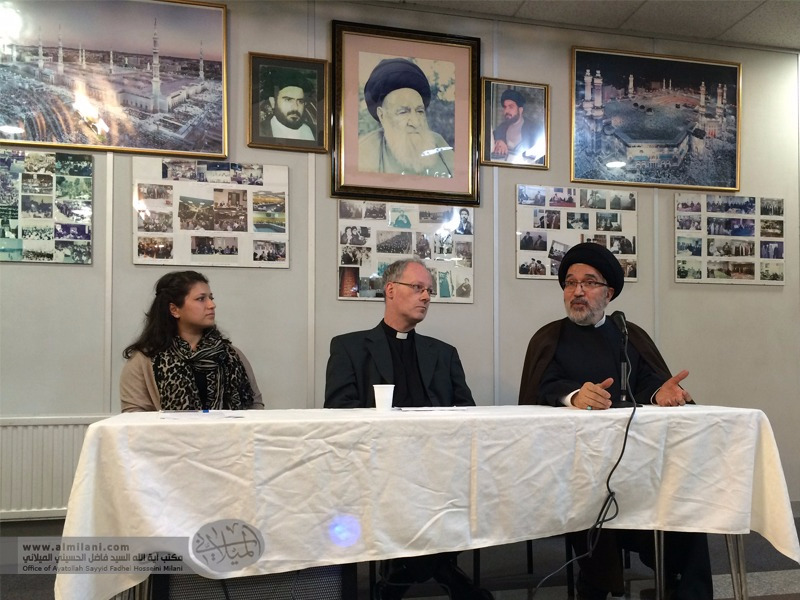 Ayatollah Milani, Dr Damian Howard SJ and Mariam Hakim reflected on the birth narratives in the Holy Qur’an and Holy Bible. It was a fascinating evening, weaving scholarship with ancient stories and contemporary life. 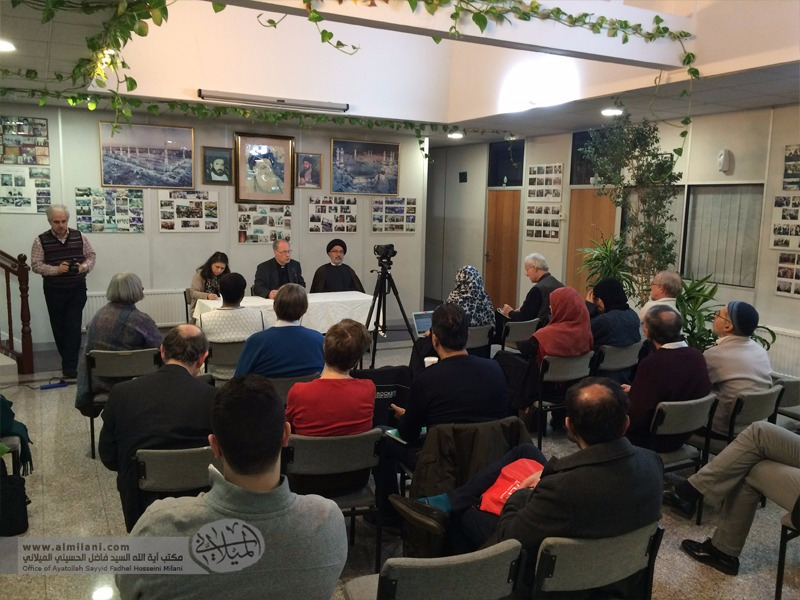 Ayatollah Milani spoke about how we celebrate the birth of the Prophet Mohammed as is mentioned in Surah 21 of the Quran as a mercy of the universe. According to Islam, Jesus is a great messenger of God. There many verses that say all messengers are respected and that those who differentiate between them are not believers. There is one full chapter in the Quran named after Mary, which mentions the Immaculate Conception which describes the birth in such an eloquent way beneath a palm tree. When Mary felt the pangs of birth she felt lonely. She was told to shake the dry palm tree. In addition to Jesus described as “al Masih” we hear Jesus is God’s word. 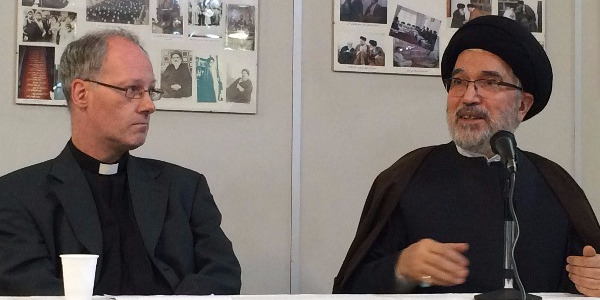 Ayatollah Milani further mentioned that all divinely appointed messengers are ambassadors of God conveying the same message to humanity. In the Quran, each prophet is approving and confirming all part of one message. Muslims believe that Jesus gave glad tidings of Prophet Muhammad. The nature of Jesus differs in that Islam clearly states the nature of Jesus is not the son of God because God does not beget or is begotten. Muslims respect Jesus son of Mary as a great messenger of God. The miracles that are uniquely referred to Jesus include, bringing to life the dead, curing diseases and shaping a piece of clay into a bird and breathing life into it. What is very important Allah tells us in the Quran that these abilities are granted by God’s permission. 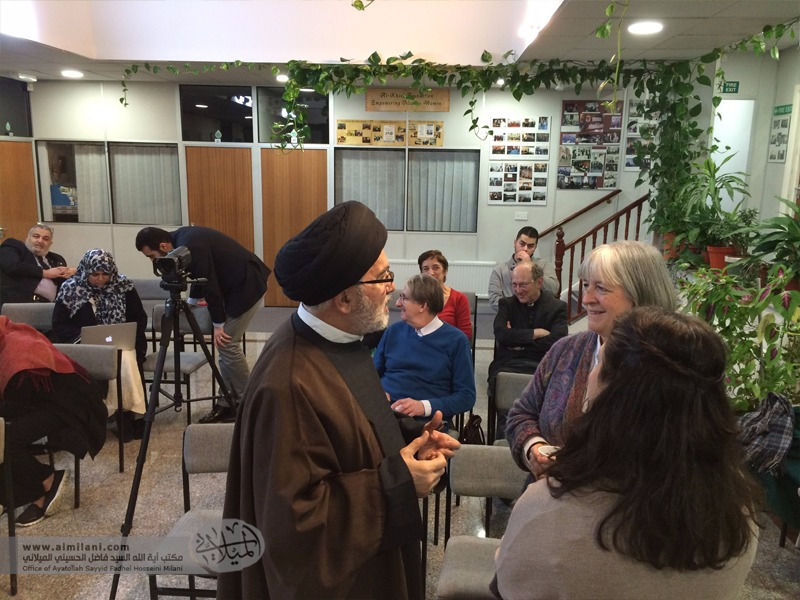 Ayatollah Milani mentioned that if we learn from Jesus and Prophet Muhammad and act on their teachings, we will see a better life.